In this delightful winter scene by William Kurelek, we see three youngsters being pulled on skis behind an empty hay rack as it heads down a road deep in snow. 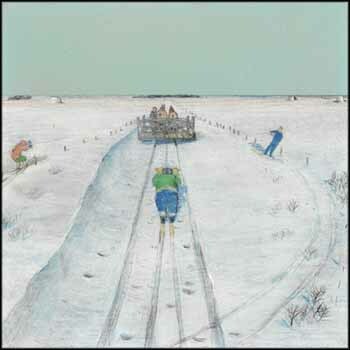 Kurelek's childhood memories are on full display here, and the authenticity of the scene is palpable. The skier behind the hay rack is in a classic tucked position, his posterior facing humorously our way. The others slalom between the fence posts, the snow (one hopes!) being deep enough to hide any barbed wire that runs between them. What fun they are having on the still, cold day, on what are likely to be homemade wooden skis. The skiers' parkas, pants and mittens are sparks of colour in the vast sea of white, and the colours are echoed here and there in the wind-drifts, tracks and hoofprints that mar the snow's otherwise untrodden surface. 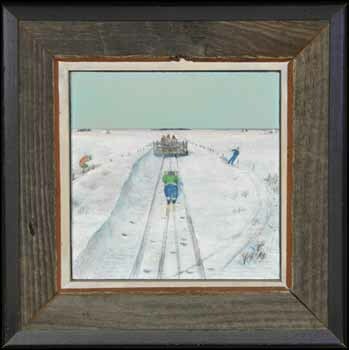 Kurelek's composition gives viewers the feeling of being right behind the skiers, so that we too share the thrill of careening through the snow.